Shares of Asia's largest petroleum refiner plunged on Thursday, dragging down the broader Chinese market, following reports that two senior officials at Unipec, the trading subsidiary of Chinese refining giant Sinopec, had been dismissed by their Communist Party overseers due to an unspecified trading loss. 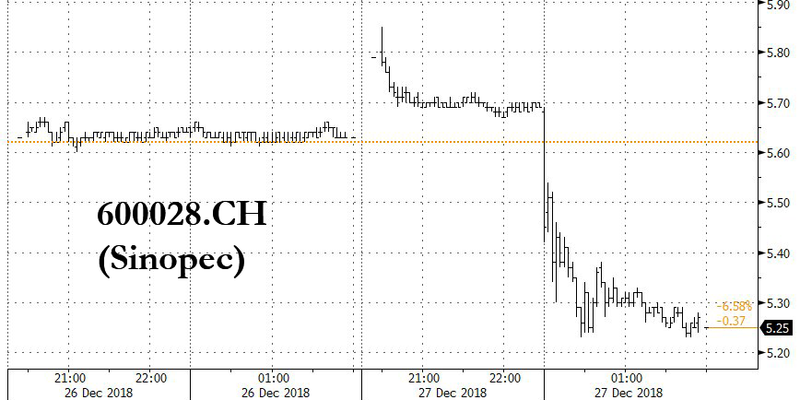 According to Bloomberg, which cited a statement from a company spokesman, Chen Bo, president of Unipec, and Zhan Qi, the company’s Communist Party secretary, have been suspended over "work reasons" (though losses in the subsidiary's energy-trading unit are widely suspected to be the true reason). The decision was made by the internal party committee at Sinopec and announced yesterday in an internal decision. News of the dismissals comes one day after US crude prices posted their largest one-day jump in two years (though it's likely that Unipec, like refiners across the world, posted large losses during the alarmingly swift plunge in oil prices during Q4, which left many refiners wrong-footed). Several refiners have restructured operations. Sinopec shares fell as much as 7.1% on the news, sending them to their lowest level in two years as shares fell in afternoon trading; meanwhile, the Shanghai Composite closed some 0.6% lower as the drop in Sinopec caused Chinese shares to buck the overall positive trend for Asia stocks off the back of yesterday's historic rally in the US. Chinese markets also suffered from data showing the first drop in industrial profit since 2015. 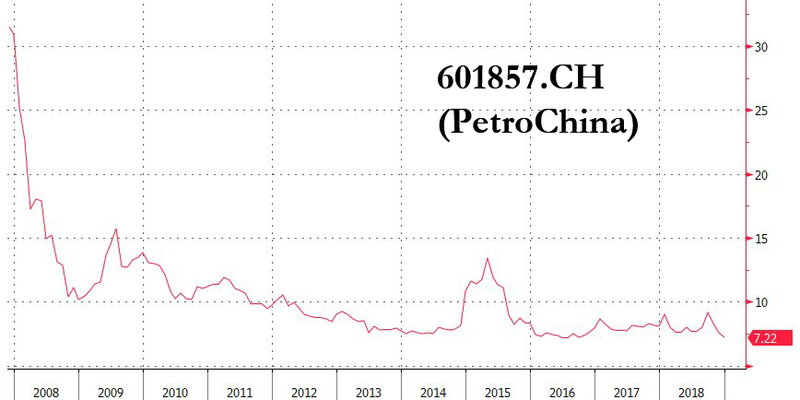 The selloff also hit shares of PetroChina, China's second-largest oil producer (which became the world's first $1 trillion market cap company more than a decade before Apple), which have slumped to an all time low. Unipec helped carry out the Communist Party's retaliation against the US by reducing its imports of US crude (the company had previously helped establish China as the biggest buyer of American crude before the trade spat intensified). Unipec’s purchases on behalf of Sinopec were a critical contributor to China becoming the biggest buyer of U.S. crude, before shipments were stopped due to the trade war between the two countries. Chen, who headed the firm’s trading business, said in September that the company had put a plan to boost American imports on hold as it assesses the impact of the dispute. While it stopped buying American supplies for use in Sinopec’s refineries, Unipec continued to lift cargoes to resell to other firms in what’s known as third-party trading. More recently, an easing of tensions has spurred more shipments. Earlier this year, Unipec was also embroiled in a dispute with Saudi Arabia, saying the producer’s prices were costly and cutting purchases just as it was boosting U.S. imports. Ling Yiqun, a vice president at Sinopec, will take over the duties formerly performed by Chen and Zhan, Bloomberg said, citing "people with knowledge of the reshuffle". Meanwhile, Chen Gang, a vice president at Unipec, will take over administrative responsibilities. Given the opacity at Sinopec (a feature common among Chinese firms) investors are awaiting more information about the size of the loss. 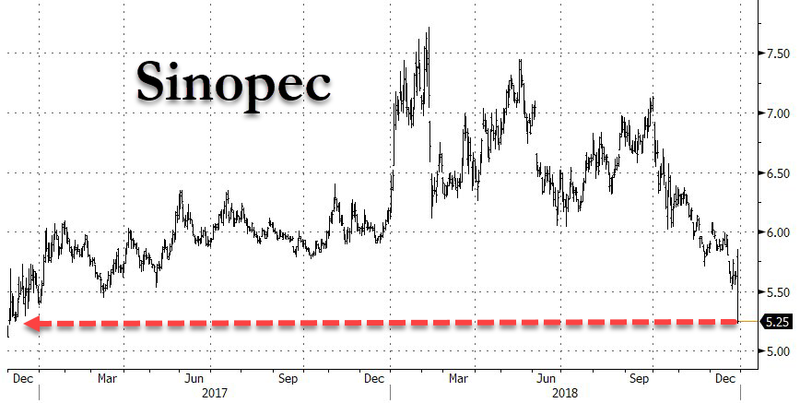 "The market is closely watching for any details of the loss, including its size and how big an impact it may have on the overall operations of Unipec and Sinopec." Li Li, an analyst with industry consultant ICIS China, said by telephone from Shanghai. "So far, the confirmed information is very limited, but it also seems that the risk is controllable." Though should the rebound in oil prices continue, it could take some pressure off the company's shares.